Japan’s Mono have been at the vanguard of that much maligned genre of music known as Post-Rock over the last decade. Mention Post-Rock to most music fan and images of serious young men playing lengthy instrumental pieces with pretentious song titles immediately spring to mind. Those bands that have aligned themselves with this genre have done much to promote this stereotypical image by largely adhering closely to the Post-Rock manifesto, almost to the point of parody. Which is a shame really, because scratch beneath the surface, and you will find some of the most inspiring and exciting music of the last 10 years emerging from this scene. On this, their 5th studio album, Mono may well have delivered one of the defining records of this genre, and certainly their most accomplished effort to date. 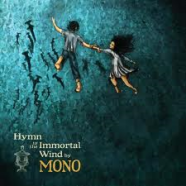 Hymn to the Immortal Wind is a towering, majestic achievement – terrifying and beautiful in equal measure, with eloquent string-drenched passages giving way to pulverising guitar and drums based climaxes, a whisper to a scream. Producer Steve Albini (at the helm for his third Mono album) employs a full orchestra to devastating effect on opener ‘Ashes in the Snow’ and this sets the blueprint for what follows –Mono never stray too far from the mix of epic orchestral strings and soaring post-rock guitars, but when the mix is this heady, who cares? ‘Burial at Sea’ employs a tribal drum beat to steadily build towards its furious climax – guitars and orchestra bleed into one and this is perhaps Albini’s greatest contribution – he never sets out to separate, to tidy things up, recognising the impact of the sound, not its component parts. Track 3, ‘Silent Flight, Sleeping Dawn’, offers some respite; a shorter, more restrained Morricone-like effort that leaves the guitars at the door, all weeping violins, straying very close to soundtrack territory at times, before segueing nicely into ‘Pure as Snow (Trails of the Winter Storm)’. ‘Everlasting Light’, the album closer, brings down the curtain on a suitably triumphant note, building towards the mother of all climaxes after over 70 minutes of awe-inspiring stuff, a fitting end to a pretty special album. For those of you who like their music in three minute, sugar-coated blasts of pop candy, this may not be the album for you. Hymn to the Immortal Wind is epic in scope, sprawling and adventurous, filled with passionate highs and emotional lows – give it the patience it deserves and you could find yourself a convert to one of the albums of 2009.